Speaking with Craig was often hysterical since he never stuck to his lines or his part and invariably would say my parts, which threw me way off! I had to learn to just roll with it. Our marriage was one that went from ashes to beauty. We have shared our journey with many through our book, Hectic to Healthy, and through speaking at different conferences. This photo shows us speaking at a marriage conference in Montreal, Canada and was in French so we had translators. (I loved speaking through translators because it gave me time to think about the next sentence and really filter what I wanted to say. Plus French is such a beautiful language!) Oh what joy it was to tell of God’s goodness and mercy in our marriage and to help give hope to others who had less than perfect marriages. 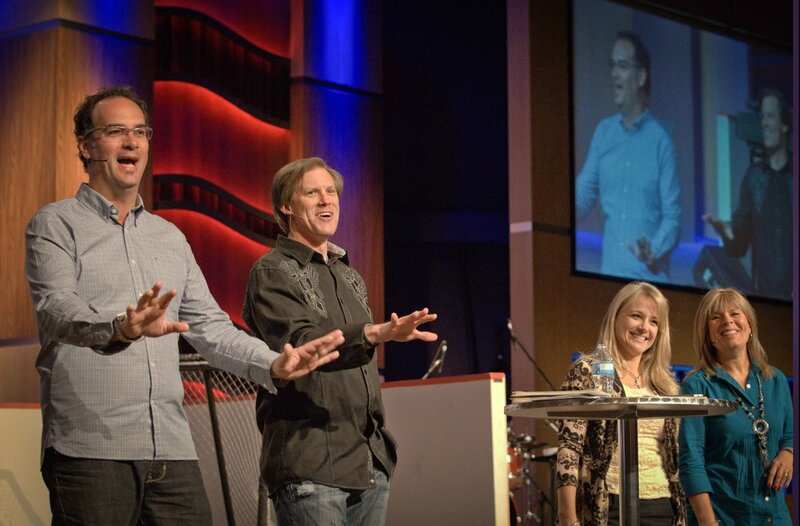 Late in 2006, I had prayed, “God if you can heal our marriage, I will share and declare your glory to others whenever I am asked.” This was not an easy promise living on a type of stage, like happens in Christian ministry…where there is an unspoken expectation that if you are a pastor, you better have it all together. Of course pastors don’t have it all togetherAnd then when God did HIS work and we did ours, beauty was the eventual result. Beauty in our marriage AND also in other people’s because we let HIM do the work through us. Dopplegangers.. Stephane Cote and Craig, Mary and her translator, Jacqueline Saint-Onge. This marriage conference was equally cool in that it was a hockey theme and we were given rival team jerseys to wear on the first day. The MC host even wore a referee uniform. Sometimes a marriage can feel like a cross town rivalry. The smiles in this candid photos show how much fun we had communicating what we had learned with couples who were open and willing to work on their marriages. One key thing we learned and shared was that if you aren’t being intentional about your relationship with your spouse, then drift naturally occurs. If you are married, fight against that drift at all costs....a good marriage is so worth the effort it takes to be intentional. You will not be the only one to be blessed by it. Craig’s sudden death, leaves a huge void in our family. And yet God is using other people to do something amazing. I want to share a little bit of that with you. Our friends have been amazing. While they are grieving Craig’s loss themselves they have rallied around me and the kids and become even closer. An example of this is Craig’s “free therapy” friends. There were Martin and J in Orange County and Virendra in San Jose. They had never met until December 27th. And then upon meeting in our kitchen, they were suddenly joined in a group hug, grown men, weeping and upholding each other. These three guys have a new friendship that encourages me and gives me hope. God is still alive and working. He is showing up and filling heart holes through his people. This past weekend we were hanging out and just hearing the guys laugh made me feel closer to Craig and closer to God. 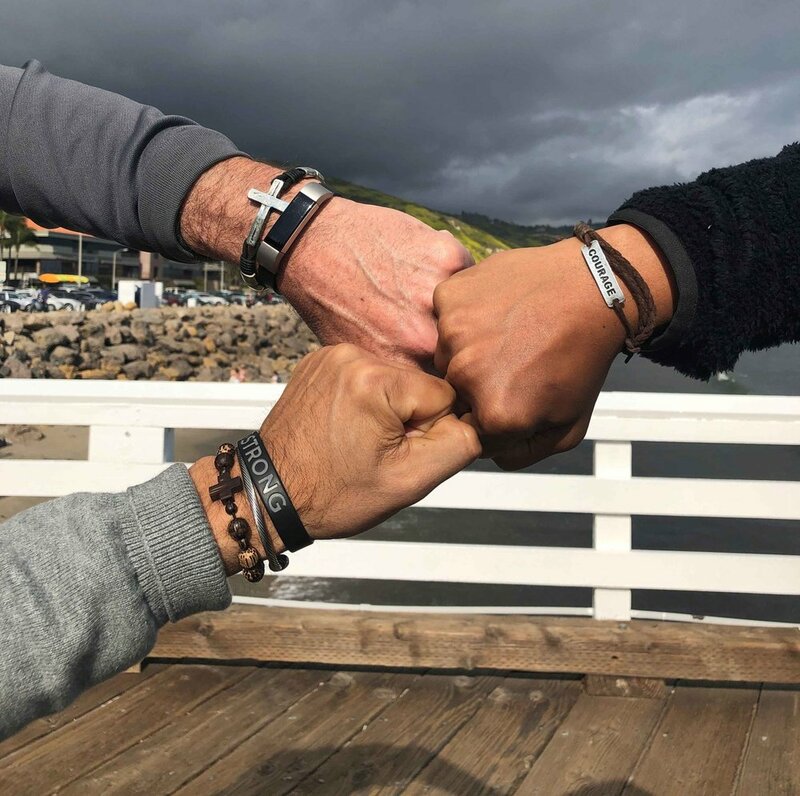 Each of these men have one of Craig’s bracelets that they wear as a reminder of their friendship and how it is important not to be isolated but to live in community. The last thing I want to share today is how God is taking a seed He started in Craig and allowing us to be the catalyst for it to grow into something beautiful. Craig wanted to encourage, equip and empower leaders. Because of the pain we felt when struggling with our marriage, leaving a church broken and suddenly isolated from our support group, we had the vision to start a ministry to broken church leaders. Whether broken through their own mistakes or of no fault of their own, to come alongside them and empower them; to encourage them that God is not done with them yet. God can heal and restore and use you in an even bigger way. Broken is temporary. Pain is temporary. We have a new mission statement for Empowered Living Foundation. More on this to come later. This is just in the early stages but I believe God is going to do great things through this. If you are willing to come to God broken and humble, He will heal you and restore you in His time. That’s the tough part. It takes time. I love these verses…promises to hold on to when you are feeling like ashes. I’m trusting God for that healing now in my heart. And remembering that He is totally able. Will you join me in this?